More people made it to the table this week, which was a pleasant ego boost. Even with having GM’d for most of these people for many years, I’m still very aware that it was many years ago and that it was in other game rule sets. As a result, hearing people, both new and old, express enthusiasm and demonstrate engagement both in the game and in the on-line forum and chat channel associated with it tickles me. 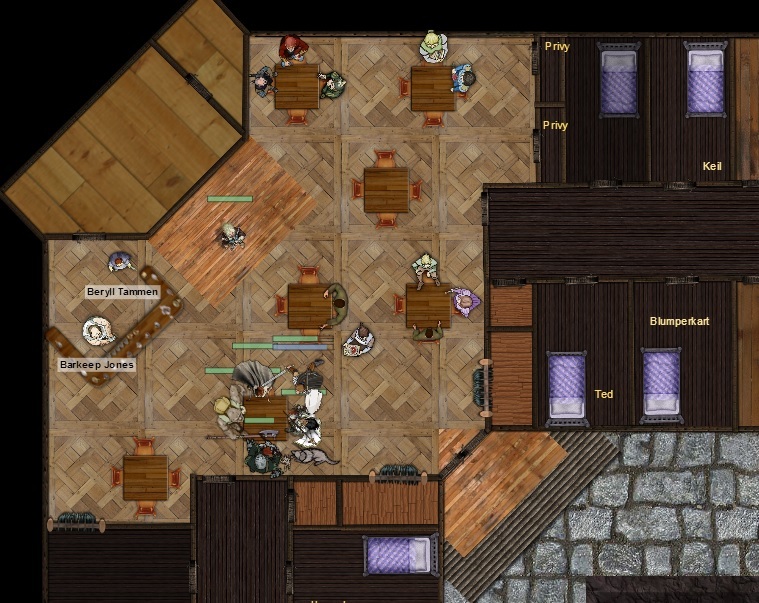 We picked up where they left off last week, having made their way to the Broken Anvil Inn, a refuge from the rainy streets of Sharn. A bit of narrative handwavium was accepted by all to place the extra players here and to retcon their having met on the road. Settling in and updating each other on their evening’s adventures, the group was soon approached by a prospective employer, the Lady Elaydren d’Vown of House Cannith. She had been working with the murder victim to retrieve a long-lost portion of a schema of historical interest to her House. Offering gold and the goodwill of her house (of particular interest to Ruin, the Warforged druid), she gave them a partial map and the journal that had been held by the murdered man – an enchanted means to open seals that they would encounter along the way. Their journey took them down into the lowest levels of Sharn, down where the disenfranchised goblins and shifters make their homes. They sought out the Rat Market, one of the shifting temporary markets serving local residents and scavengers alike, where a goblin merchant called Skakarn was persuaded/intimidated into revealing the route to a particular obscure sewer cluster named in the maps. He fled when intruders arrived to challenge the party, no doubt harbouring resentment for the way these rich upper level adventurers treated him. Once more, they found people trying to steal away the journal. Another Warforged – this time a thief – led a team of trained Shifter warriors against them. The fight was brief but brutal, punctuated by valves shooting streams of sewage across the already treacherous battlefield, leaving the party battered but victorious and able to approach the hidden seal to open the way into tunnels that have been sealed for a thousand years. So – we’re gathering speed in this prologue, and starting to get a feel for party dynamics. Tactics and partnerships are starting to evolve, and I’m looking forward to how the group evolves as more of the regular players are able to free themselves from various short term work commitments again. This entry was posted in Dungeons & Dragons, games, gaming, Geekery, Roll20, Roll20 and tagged Dungeons and Dragons, games, gaming, geekery, Roll20. Bookmark the permalink.